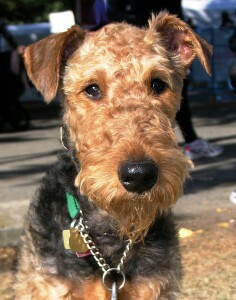 Airedale puppy Skeena was born in 2007. A year later, her owner developed an illness and subsequently lost his job. He could barely afford to feed himself. Providing his puppy with food became a nearly impossible task. Dependent on table scraps and dog food provided by his friends, Skeena survived but did not thrive. She became thin and her coat grew dry, her skin flaky and inflamed. Desperate for cash, her owner decided to breed Skeena so he could sell the pups to earn some money. Fortunately, for Skeena’s sake, this plan did not come to fruition. Poor starved Skeena might have died giving birth to puppies; she certainly did not have the physical resources to feed them. Enter a pensioner with little money herself – a friend of Skeena’s owner. Extremely concerned about Skeena’s condition, she managed to gather together a few dollars and offered to buy Skeena. The owner, luckily, agreed. This Good Samaritan took Skeena to the vet at her own cost and had her bathed and groomed as well. She planned to keep the dog but, in the end, was unable to do so. She offered Skeena to AireCanada. Skeena turned up at my house to be fostered – an emaciated skin-and-bone skeleton covered in rough, wiry, brittle hair through which infected skin could be glimpsed. We promptly put Skeena on a diet rich in nutrients and protein. We urged her to play with our three Airedales to improve her stamina and develop muscle. She fell in love with our young male and the two bonded like littermates. Throughout all her hardships, Skeena remained a bouncy, bubbly, happy little girl – one who was ball crazy in the extreme. Skeena chased a ball for as many hours a day as someone could be persuaded to throw it for her! Fostering Skeena was guaranteed to result in a sore arm. Skeena was checked out thoroughly by our wonderful veterinarian, Dr. Pawel Cichon at Sunwood Veterinary Hospital. Once she was deemed strong enough, she was spayed. While Skeena’s medical bills cost AireCanada over $500, we were committed to helping her get ready for a better life. That life became a reality when a wonderful and Airedale-experienced couple adopted Skeena. They dote on her endlessly and care for her as if she were a very precious treasure. Despite a very rough start to her life, Skeena has found friends who genuinely care about her, who saved her from a painful death by starvation and now are ensuring she lives happily ever after. Truly, Skeena’s story is a cautionary tale of how life takes unexpected turns and knowing when to ask for help is so important to the whole household. 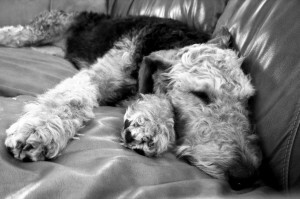 When jobs are lost, the family pet can suffer equally along with other family members. Skeena was a victim of tough economic times and possibly one of the luckiest dogs we have ever fostered for AireCanada.